Rabbit Stew: Record 'Jumbo' Pistol. 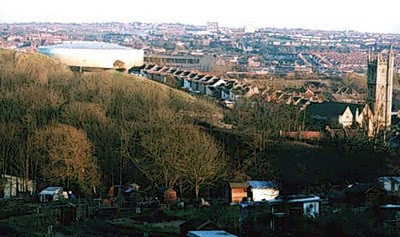 I was living in Bristol during the 90's and working in what was called a 'therapeutic community', a kind of half-way-house for people who'd somehow managed to get themselves described as having 'mental health problems'; it was based in a very large, stained-glass-window-filled old house at the top of a hill in the south of the city. At the bottom of the hill was a shop selling air guns and - when I'd finished a day-shift - I'd walk down the hill and wait outside the shop for the bus that would take me home. While I waited, I'd look in the window at the pistols and rifles. I wanted an air pistol; I'd had one when I was a teenager - I'd spent a happy summer shooting cans with my girlfriend in the back garden of another friend's house after school - but now it didn't seem to fit that well with the kind of person that I thought I was; now I was some kind of a counsellor, a serious, grown-up who'd put away childish things. This kind of person - so I thought - they just didn't buy air guns. But the window drew me and the guns on display inside seemed compact and thrilling to me; they were charged with some sort of energy and potential that I wanted - even though I felt like I shouldn't. The man in the shop showed me a few guns and then he picked up a small one with a wooden handle. 'This one,' he said, 'it's popular with handgun owners,' he flipped the pistol over and slid back the base to show me the space inside the hollow hand-grip, 'they fill this compartment with pellets and then it weighs about the same as a hand gun - so they can practise their shooting with the same kind of weight.' He handed me the pistol and that was it. I walked out of the shop with the gun in my bag and waited for the bus home with a keen feeling of excitement whirling around in my head. I lived in a built-up part of the city but across the busy main road outside my flat was an area of woodland - slightly litter-strewn - with a railway line running to one side and then a few steep fields of long, scrubby grass that rose up to to a clearing and a vantage point called St. Werburgh's Hill. Groups of students and locals would often go up the hill in the evening to light little fires, smoke dope, drink and look at the city lights while trains rumbled by in the dark. I'd put the pistol and pellets in my bag, walk across the road and then wander around the woods - on and off the dirt paths - loading and re-loading the pistol and taking shot after shot at the plentiful coke cans, discarded prams, traffic cones and other bits of nameless, rusted junk that had been dumped there. People would walk through the woods now and then and I'd stick the gun in my bag and wait till they'd gone before starting again when it was quiet. There were certainly birds and squirrels in the wood but the idea of taking a shot at them never occurred to me; if anything, I felt disgust at the thought that anyone might do such a thing. A dismantled red-brick bridge with its centre span missing sat on two sides of the railway line there and, after having dashed across the tracks in fear of my life and set up a row of cans on the other side, I'd cross the line again, climb up the bridge support and then sit there and take a dozen shots at them across the track. The pistol was fairly low-powered - I'd been disappointed when I realised this - but even so, I found that these twenty-yard shots would often end with a satisfying crack and rattle as the can span away with a pellet inside. Back in the flat I'd sit in the evenings and take pot-shots across the room at paper targets I'd designed on the computer at work. I bought a bag of little metal darts with soft-feathered nylon tails and I'd lie on my settee and listen to the traffic straining up the hill outside while I fired dart after dart into the painted wooden picture rail that ran around the walls of the room. I got rid of it in the end; I've no idea why. I sold it back to the shop that I bought it from and forgot about it. Ah indoor air pistoling! Such fun. Accomplice deej and I used to set up a range we called 'bisley' in his old flat. At the weekends when his daughter was away we'd crouch under the window in the front room, shooting down the hall at targets pinned to his daughters bedroom wall. we were both over 35 at the time. For Shame. Ah, the good old days! I remember them well. Thanks for taking me back. 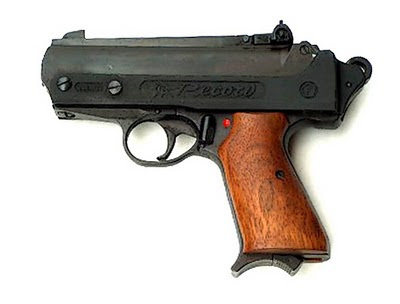 A good piece this; it brought back memories of my first air pistol, a 1980 Beeman Webley Tempest in .177 caliber. I used to take it into the woods to plink at an old discarded can or a pine cone. Good writing, keep up the good work.